At heart, recruiters are hustlers. They like to pick up the phones and make calls to win new business and place their candidates. In other words, sitting back and waiting for leads to come in just doesn’t feel right. As a result, passive marketing strategies such as SEO have not caught in the world of recruiting at the same rate as other industries. However, when you look at the numbers, this makes little sense. There is concrete data that show that Google can drive significant traffic to your recruiting website and a portion of that traffic will be new leads that you would have not otherwise acquired. Don’t believe me? Let’s dig into the numbers and we’ll prove it with some basic math. Suppose you are an executive search firm specializing in the construction sector. Most of the firms in this subset of the recruiting industry do not have strong web presences but the numbers say this is a big mistake. Because that’s what the number say. We start our investigation by creating a Google AdWords account. Google AdWords is the platform used to buy ads that are inserted at the top of your Google search. While we are not going to purchase ads, we are going to take advantage of a feature within AdWords that will help us significantly. When someone wants to buy ads, one of the important considerations is whether anyone is actually searching for the search query on which you’re bidding. Google has therefore built a tool called the Keyword Planner that helps you answer this question. To get started, you will need to go to Keyword Planner (under the Tools menu option). 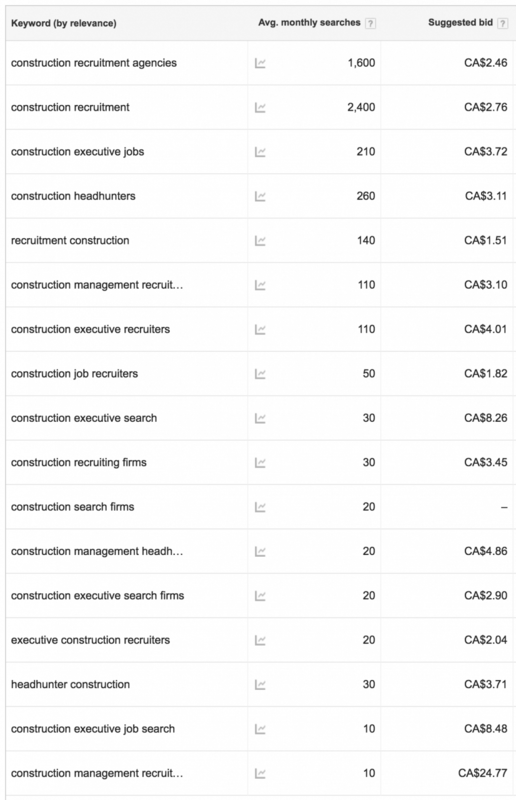 We enter “executive search construction” into the first section of the tool labeled “Search for new keywords using a phrase, website or category” and Google gives us a huge list of potential search terms we might want to target, some of which are relevant to our business. We comb through this list looking for terms that are not germane to our industry and remove them. Copy and paste those terms into the second section of the Keyword Planner tool labeled “Get search volume using data and trends”. We immediately discover that there are around 4,200 searches per month for these keywords! This is a significant volume for a niche query. We also get a more granular look at which keywords provide the greatest opportunities so we know what to target. Let’s say we immediately begin our quest to target these queries with SEO. We’ll assume that ultimately, we begin to rank, on average, in the third position for these queries. According to Moz, a search engine tracking company, when you rank in the third position for a Google search, you can expect to receive about 10% of the clicks for a given term. If we do some math, we can see that this translates to about 420 site visitors per month from Google traffic alone. Assuming we can convert 1 in 200 of these visitors to a new client, this traffic yields about 2 new clients per month or 24 over a full year. At this point, the power of Google should be clear and you should already be thinking about how you’re going to use SEO to shoot to the top of the search rankings. About the author: Zack Gallinger is the founder of a website design and marketing company, Talent Hero Media, that focuses exclusively on the recruiting and staffing industry.